Autumn Sunday dinners are the best. Yesterday was a beautiful fall day in Seattle. It wasn’t completely sunny, but it was mostly dry, and not too cold. We did Sunday things all morning: gym for me, then lazy brunch, a few cleaning chores and a very important reorganization of my sweaters (heavy sweaters to the front of the closet, light to the back). Mid afternoon, we took the dog for a long walk in Discovery Park, letting her burn off some pent-up energy with a long session of Running in Circles in the Long Grass, a favorite game. We got home around 4 and I started dinner preparation, because Sundays in autumn mean Family Dinner. Now, somewhat sadly, Family Dinner is only for the two of us, but I cook like I would if company was coming. And why not? Sundays are for relaxing, puttering, kicking back with a good book, taking long walks with the dog, enjoying life– neither of us is rushing out to class or the gym or dragging home from work. We grocery shop on Saturday, so I usually have all my “good” ingredients handy, and I have the luxury of extra prep time if I need it. Now, I would love to share Family Dinner with others, and often think about trying to start a supper club of sorts. But… that would mean losing some of my puttering time during the day, so for now, I will cook wonderful, hearty, special dinners for two. Dinner last night was braised lamb shank with horseradish mashed potatoes. 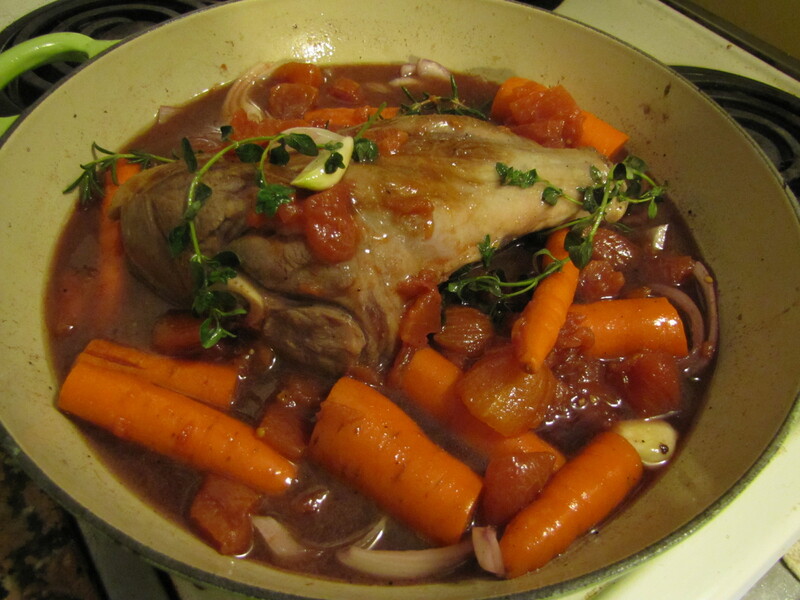 I had never worked with lamb shank before, but I love cooking with lamb and R is a big fan of pork shank, so I thought I would give it a go. Because it was a new protein for me, I bought one large (for us) shank from the butcher; it was just under two pounds. Compared to lamb chops or leg of lamb, it’s a reasonably priced cut, and it is well-suited to a long braise or roast, my favorite way to cook meat in the fall. The shank I purchased was well-trimmed, though I did take off some silver skin. I researched recipes for a bit but then decided to strike out on my own, as I often do, taking elements from a stifado (Greek lamb stew) recipe I found in the Gourmet cookbook and using some techniques I often use with other roasts. I started by generously seasoning the lamb with kosher salt and ground black pepper. I heated about 2 tablespoons of olive oil in a Dutch oven on medium-high heat and put the shank in, covering it immediately and leaving it alone for about 5 minutes. 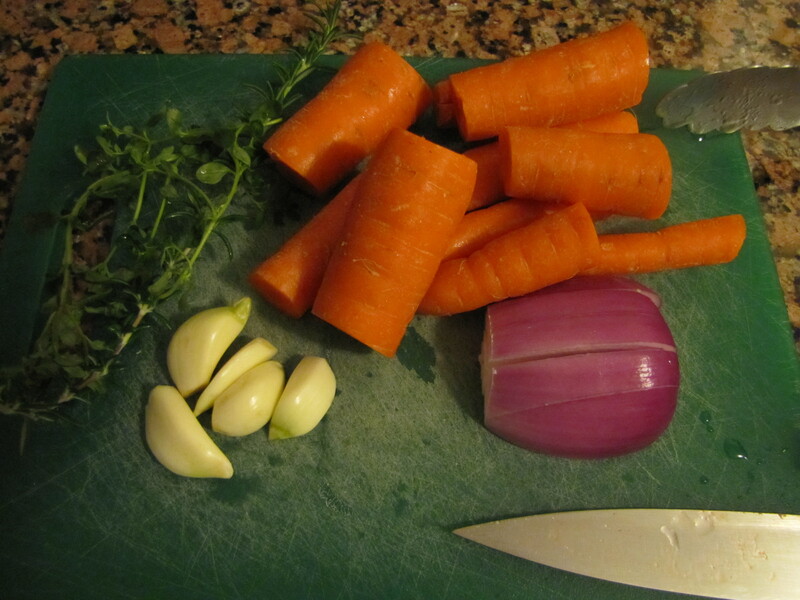 I wanted a good sear on all sides, so I repeated the same process with the other side while I prepped my vegetables: carrots, red onion and lots of garlic. When both sides had a good, golden-brown color, I used tongs to turn the meat and get narrow edges and each end seared. Then, into the pan with the meat went a small red onion, sliced cross-wise; three carrots cut into 4-inch sections (I didn’t even peel them because they were fresh) and 5 cloves of peeled garlic. I had an open bottle of shiraz with about a cup left, so into the pot went that, too. You can use any good, dry red wine, or stock if you prefer to cook without wine. At the 23rd hour I decided to add a can of diced tomatoes with their liquid. Then, a 6-inch sprig of rosemary and two 6-inch lengths of thyme were placed on top of everything. The fragrant lot went into the oven, preheated to 425 degrees, for 90 minutes, with one turn of the shank about an hour into the cooking time. My little apartment smelled so good! I wanted my veggies to cook down as much as possible, to “melt” the onions and garlic and create a paste-like consistency. If you prefer more of a sauce, increase the amount of liquid in your pan by adding extra stock or water; probably another 1-2 cups would have been just fine. 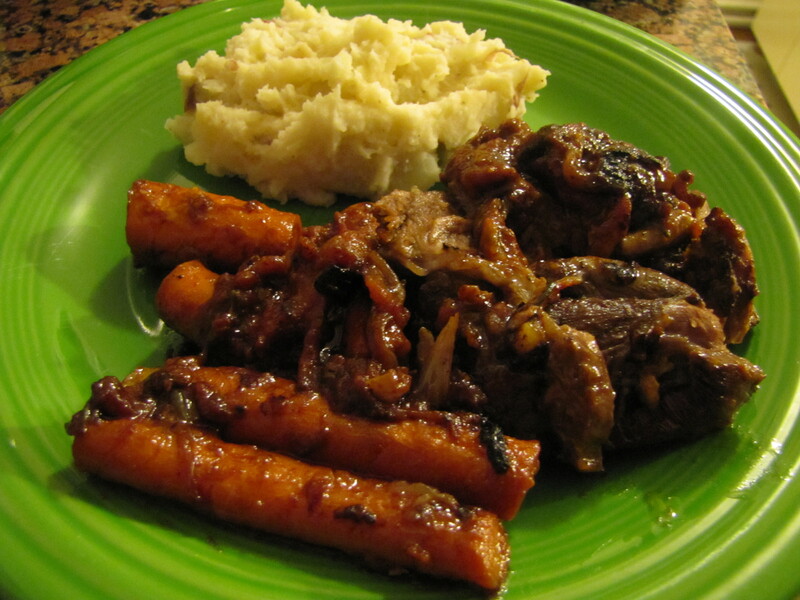 My final product was a thick sauce of tomato, onion and garlic, perfectly-cooked carrots and tender, flavorful lamb. I could see using the same recipe with a pork shank or even a pot roast. If you don’t have (or like) rosemary or thyme, oregano would be a nice replacement for either herb. One lamb shank was a good amount of meat for two people, about a four-ounce portion for each of us, which is what I try to plan for. If you are cooking for more people, or want larger portions, it would be pretty easy to add another shank of the same size to this recipe, or buy up to four smaller ones. For my side dish, I boiled 3 medium red potatoes, starting them with half an hour left in the cooking time for the lamb. I drained them and mashed them with 3 tablespoons of butter, 2 tablespoons of prepared horseradish (R and I are fans of horseradish– if you’re not sure, start with 1 tablespoon and work up, to taste), about a quarter-cup of milk, salt and pepper. They were creamy, a little spicy and tasted really good with the tomato-onion-garlic sauce. I have a ton of left-over potato, which may just find its way into a potato pancake. I think it would also be pretty awesome as the topping on a shepherd’s pie. Another satisfying Sunday dinner, enjoyed by all. 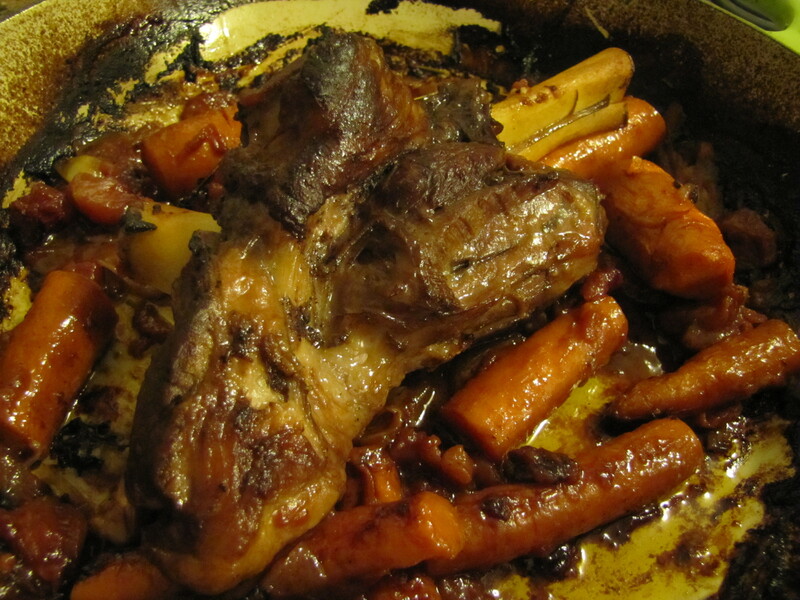 I will definitely buy lamb shanks again, and the horseradish potatoes will show up on the table again, too. Next week, I think a roast chicken may be in order. What’s your favorite autumn Sunday dinner?